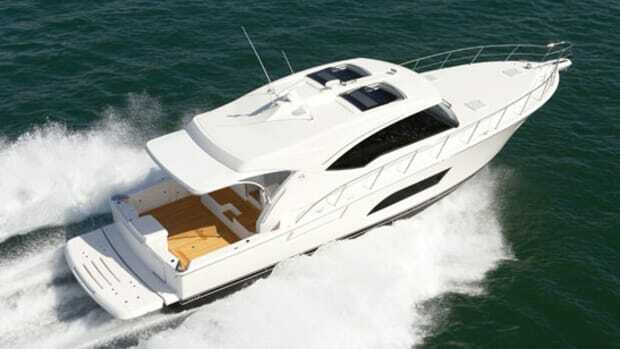 Riviera’s new Enclosed Flybridge lets you pick your power and your point of view. 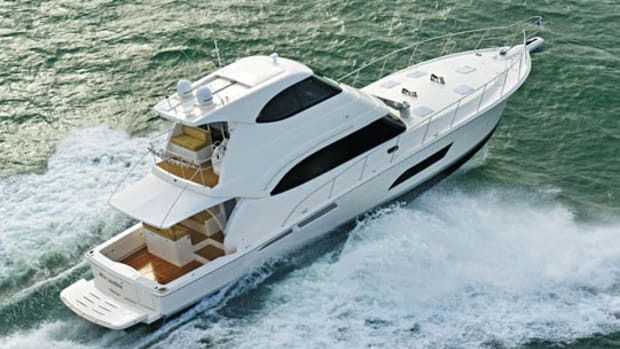 Some boaters are all about choice—they want options and plenty of them. Others avoid making decisions and are happy to take what’s presented to them. 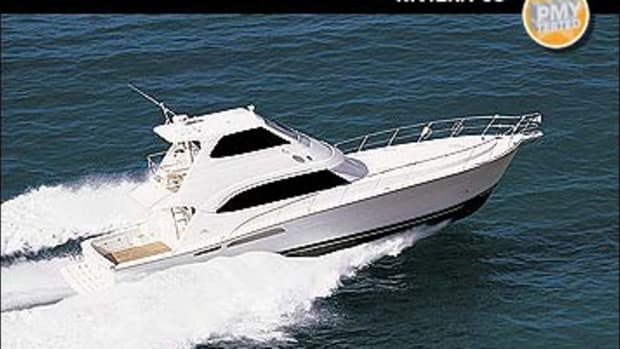 For those of you in the first category, I have the perfect boat: the Riviera 53 Enclosed Flybridge. This boat is all about choice. 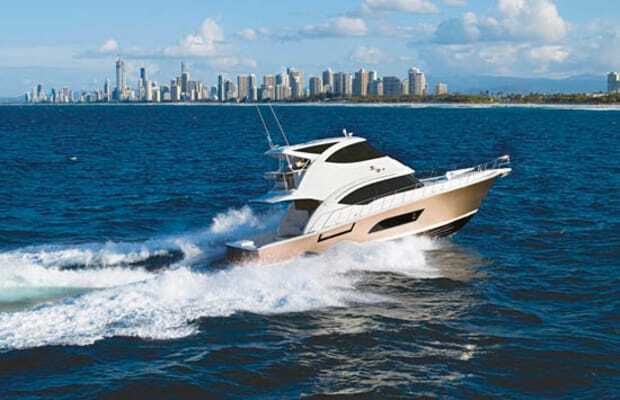 Regarding power, there are twin ZF 4000 pods connected to MTUs or Caterpillars rated to 1,015-hp, twin Volvo Penta IPS1200s, or the setup I tested in Australia, triple IPS600s. Not only does this menu represent a gearhead’s smorgasbord, it’s also a major engineering feat considering the disparate weights and centers of balance of each option. Riviera pulled it off by using a proprietary version of CAD it terms Riviera’s “Uni-Graphics NX three-dimensional software.” The software allows designers to vary a number of parameters, including engine weight and position, and still optimize running trim and balance. I was able to test only one permutation, the triple IPS600 version in Hull No. 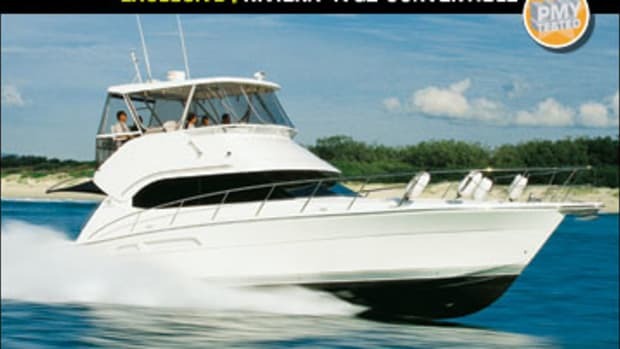 1, which debuted at the Sanctuary Cove Boat Show. I am not a fan of triple- or quad-engine installations, primarily because of their added mechanical complexity. 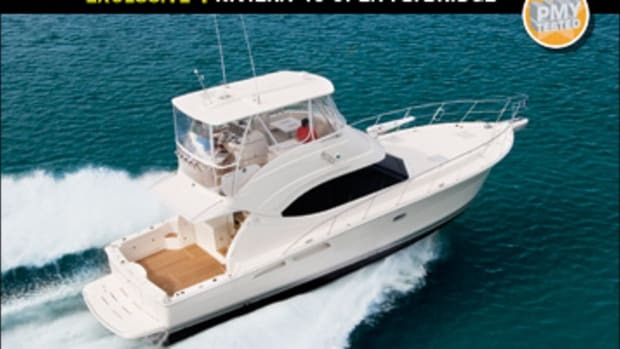 Yet I found the 53 to be one of the best-balanced boats of its size I’ve ever run. Handling was razor-sharp, and her turning radius was rewardingly tight—a couple of boat lengths at WOT. Sound levels were low, peaking at just 67 dB-A at full throttle. 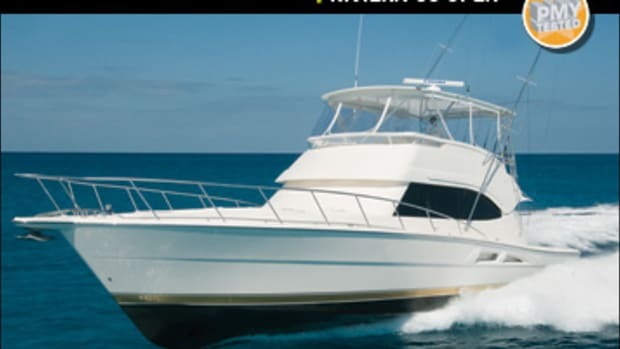 Vibration was nonexistent, and engine access—an Achilles heel of triple-engine installations—was flawless, thanks to something I’ve never seen on a 53-footer before: a cockpit sole that lifts electrically to expose everything—and I do mean everything. And for those heavy-weather days when you need to check on the mains and don’t want to venture outside, there’s a day hatch in the saloon leading to the ER. The 53’s sharp performance is due in large part, I suspect, to experience. 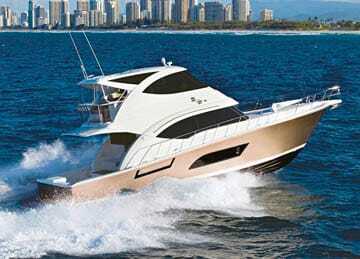 Riviera has a lot of it with IPS—the company has built more than 150 boats with it. IPS installation is replicable—once you get Hull No. 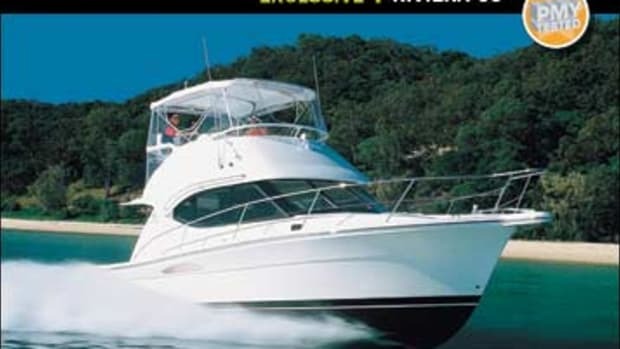 1 sorted out, subsequent boats should require no deviation from the system. Figuring out that first boat is the trick, and some builders do it better than others. The Riviera guys tell me the 53 was dialed in right out of the box, and it surely felt that way to me. Of course, we all know that pod propulsion pushes the engines aft, freeing up space for things other than blocks of iron. On the 53, one of those is a single 925-gallon fuel tank that, combined with decent fuel efficiency, provides good range: 462 miles at about 25 mph (3000 rpm). 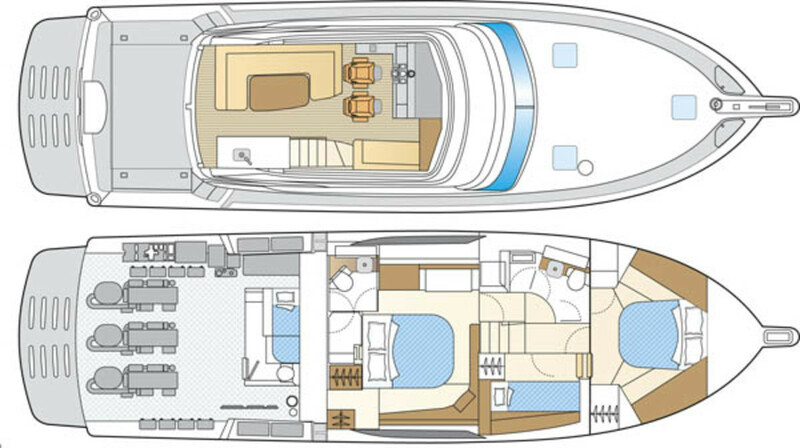 Another is a full-beam amidships master with en suite facilities, a first for Riviera in this size range. Yet another first in this range is an enclosed bridge than can seat ten, and the minute I walked up the interior stairway to it I knew this would be the focal point of the boat. (The big cockpit, which has two barbecues, is a close second.) It’s a mystery to me how Riviera managed to make it so big and avoid a top-heavy appearance. It has all the amenities you’d expect, such as a wet bar and icemaker/fridge, plus two you might not. One is a standard electric sunroof. (Air conditioning is also standard.) The other is another big choice: helm position. You can have it all the way forward or all the way aft. On my boat it was forward, an excellent choice for cruisers. 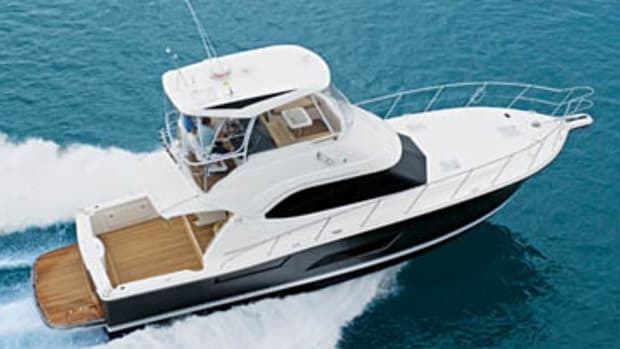 The aft position allows the helmsman a good view into the cockpit, something that should be particularly appealing to those who chose to rig the 53 for serious fishing. I enjoyed my time at the wheel of the 53 but couldn’t help wondering how she would have run with the ZFs or bigger IPSs. But that’s the trouble with choice—no matter how many you have, you’re never totally satisfied. 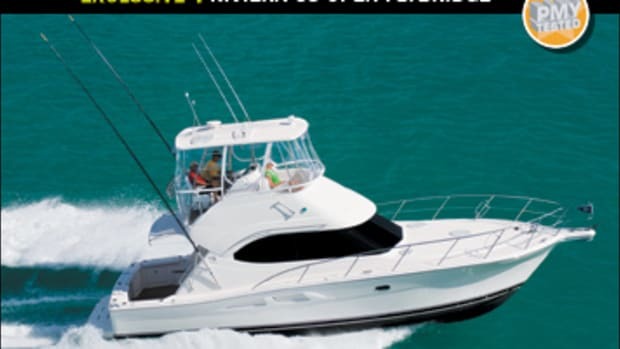 Speeds are two-way averages measured w/ Raymarine GPS. GPH taken via Volvo electronic display. Range 90% of advertised fuel capacity. Decibels measured on A scale. 65 dB-A is normal conversation.